Come join us at Shabbat services to learn from the thought-provoking teachings of our rabbi, Seth Bernstein. Experience the joy of singing led by our cantor, Linda Baer. Feel a great sense of community as we join hands and sing the blessings at our Oneg Shabbats. Our members reach out to make guests and new members feel at home. We respect diversity and welcome all into our family. 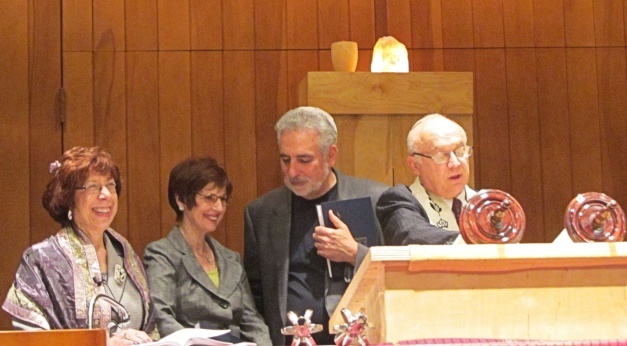 Our rabbi’s sermons are a mix of relevant topics of the day and Torah discussions. Throughout the service our rabbi may read us some of his favorite psalms or a poem that he finds moving and appropriate for the occasion. Our cantor leads us in a variety of music, from traditional to modern, designed to please every ear and expectation. On occasion we have musical accompaniment or singing by our choir to enhance the service. Following the service, we all gather in a separate room to recite the prayers for the wine and bread. An especially warm tradition at Bet Aviv is that we hold hands as we recite the Ha Motzi. Following the prayers, we all gather to catch up with the news our fellow congregants have to share and to meet newcomers. If you would like to experience a Bet Aviv service for yourself, please contact us to let us know you’re coming, so we can greet you. You are most welcome to join us. All Shabbat services are held in the Meeting House, usually in Room 200. Evening services begin at 8:00 PM. Morning services start at 10:00 AM.